3D bioprinting is a technique by which viable cells and tissues are printed in 3D in a controlled environment and the final product can be used to a certain extent as a replacement for actual tissue. The technology is still very much in the nascent stages, however will soon be in a position to be commercialized on a large scale by the end of 2020. There are already a number of research centers that are experimenting with the technology today and a number of research departments of various universities that are investing in the research of this technology. The applications for bioprinting are many ranging from the obvious healthcare industry to the cosmetic industry. Bioprinting will be able to provide replacement tissue for burn victims or anyone that needs a skin graft and can also provide certain slices of internal organ tissue. Looking at the cosmetic industry, this industry has always been infamous for testing on animals many of their products which include deodorants, lipstick, make-up and so on. The testing is done on animals to see what the side effects are and only then are these products made available. Through bioprinting, the testing can be done on skin that is printed and would provide the companies a better subject for testing rather than always looking at animals. Although the market is still in the early stages, it its expected to be worth more than $10 billion by the end of 2020. The healthcare industry alone will be able to utilize this technology completely for R&D purposes as well. 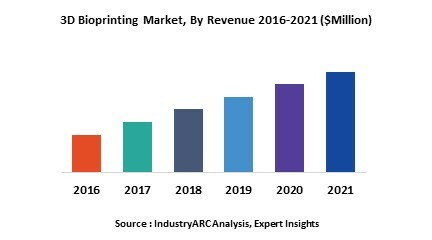 At present, the market dynamics in the North American region are responsible for the region’s largest share of the 3D bioprinting market in terms of revenue. The need for advanced healthcare and the ability of the consumers to pay for it is driving the market in North America. Furthermore, a significant amount of research is currently underway to make advances in this field.